One of the things that consistently amazes us about ambient prodigy Phillip Wilkerson is the breadth of his work. He is as comfortable creating light mesmerizing ambience as he is with abstract textures or dark ambient soundscapes. What is most astonishing is the level of quality he maintains across all of it. But then along comes this enchanting new album called Sun Tracer, a collection of electronic ambient pieces that thoroughly embrace tonality in what can only be called rapturous light ambience. And our level of astonishment increases by another order of magnitude. Despite the heady science and cosmic scope of his original inspiration, he also injected a huge dose of humanity into the music. As a result, we think this album would be as suitable as a soundtrack for a space voyage following old Sol through the galaxy as it would be as the music one listens to while relaxing effortlessly beneath the Sun on an exquisite beach of white sand and a sky of deepest blue. Both are expressions of worship for our source of life, and both are equally appropriate thematic interpretations of the music of Sun Tracer. A truly sublime experience, in every sense of the word. 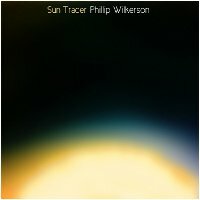 Earth Mantra is extremely proud to be bringing our listeners the music of Phillip Wilkerson, and are particularly proud to be releasing Sun Tracer, an album we feel is destined to be one of the top releases of 2010. This music is like made for people like me - I love everything about science and technology, and no surpise - also science fiction. This album has everything I like in an ambient album - analog beats combined with drifts and atmospherics, AND it has a space theme, which instantly grabbed my attention. Some pieces are analog-style (Boddy,Boots,Schulze...), others are warm drifts, some are more structured and amospheric, and others are a combination of the three styles. Some of the pieces are light and uplifting, others abit darker in tone, adding drama to the music. It is a highly visual album, it tells a story, it is easy to picture the images of space and spaceflight when you listen to the album. For someone like me this album is pure audial and intellectual bliss.